Plainville Livestock held their first first livestock auction at the brand new facility on July 11, 2017. 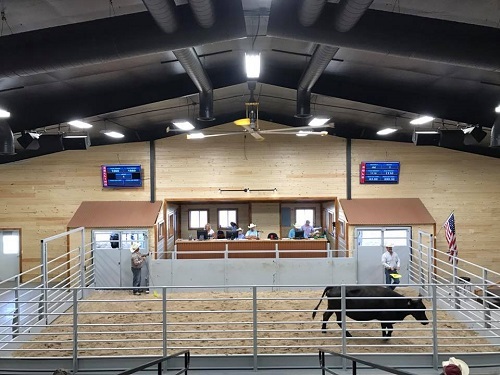 The new facility, built adjacent to the old sale barn, is larger, more efficient, more comfortable, and provides an optimal experience for livestock sellers. Plainville Livestock was recently honored at the Rooks County Business Appreciation Month Awards held at the Wild West Saloon at Rooks County Golf Course. The business was honored in the Service category with a Merit Award. Plainville Livestock just completed an all new building to hold their weekly livestock auctions. This new facility is sure to be a shining star in western Kansas as example of bringing new technology to the livestock auction process. They have also added numerous pens and load outs through the years to improve their services. Owners Ty & Camden Gillum have grown the business into a regional center with 25 employees.